Grossman Publishers. Hardcover. VERY GOOD. Light rubbing wear to cover, spine and page edges. Very minimal writing or notations in margins not affecting the text. Possible clean ex-library copy, with their stickers and or stamp(s). Borosage, Robert L. and John Marks, eds. Grossman Publishers, 1976. Hardcover. Acceptable. Disclaimer:A readable copy. All pages are intact, and the cover is intact. Pages can include considerable notes-in pen or highlighter-but the notes cannot obscure the text. At ThriftBooks, our motto is: Read More, Spend Less.Dust jacket quality is not guaranteed. Grossman Publishers. Used - Good. Former Library book. Shows some signs of wear, and may have some markings on the inside. Grossman Publishers. Used - Very Good. Great condition for a used book! Minimal wear. Grossman Publishers. 1976. Hardcover. UsedGood. Hardcover; fading and shelf wear to exterior; former owner's stamping insid e front board; fading to page edges; otherwise in good condition with clean text and tight binding. .
Grossman Publishers. Used - Good. Good condition. Acceptable dust jacket. Grossman Publishers. Collectible - Very Good. First edition copy. Collectible - Very Good. Very Good dust jacket. Grossman Publishers, 1976. Hardcover. Good. Grossman Publishers, 1976-01-01. Hardcover. Like New. New York: Grossman/Viking, 1976. The jacket has the price clipped from the front upper right corner flap, and some minor wear along the top edge of the spine.. Not Stated. Hardcover. Very Good/Good. 4to - over 9¾" - 12" tall. 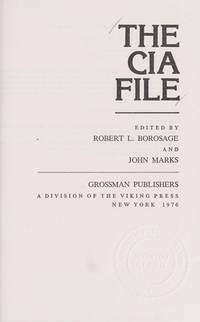 Borosage, Robert L.; John Marks, eds. Grossman Publishers. Hardcover. 067022247X Like New Condition. . Fine. Grossman Publishers. Hardcover. 067022247X New Condition. . New. Grossman Publishers, 1976-01-01. Hardcover. Used:Good.